Robin Eisner is a Contributing Writer for NIDA NOTES. A recent NIDA study has identified a potential association between heavy abuse of MDMA (Ecstasy) and persistent deficits in mental processing speed and problem solving. The preliminary study, with a population carefully selected to demonstrate the effects of MDMA in the absence of other drug abuse, also indicated that a threshold amount of MDMA exposure may have to occur before measurable impairments develop. Dr. John Halpern and colleagues at Harvard Medical School's McLean Hospital, in Belmont, Massachusetts, and the University of New Mexico, Albuquerque, recruited 23 MDMA-abusing and 16 non-MDMA-abusing rave culture participants, all of whom consumed marijuana and alcohol only rarely if at all. To find such a population, Dr. Halpern's team recruited their volunteers in the vicinity of Salt Lake City, an area culturally dominated by the Mormon church, which frowns on the use of alcohol and other substances. Study participants included Mormons but also atheist, Hindu, and Catholic youths who were influenced by growing up in a devout, conservative area. Heavy MDMA abusers were slower and made more errors on the Stroop, a test of attention and mental processing speed, than did moderate abusers and nonabusers. The test requires subjects to respond as quickly as possible with the color of ink in which each word is printed while suppressing the urge to read the word. In the above illustration, the correct answers are (first line, left to right) blue and then black; second line, orange and then green. Study participants took urine and breath tests to confirm that none had taken any intoxicating or illicit substances for at least 10 days. Dr. Halpern and his colleagues then administered a battery of neuropsychological assessments. The MDMA abusers performed less well than nonabusers on almost all of the tests, but the differences were not large enough to rule out the possibility they were simply due to chance. To probe for slower developing exposure-dependent effects, the researchers conducted an additional analysis, comparing MDMA abusers who had taken between 60 and 450 lifetime doses with the moderate abusers and nonabusers. The heavy abusers still did not exhibit any verbal handicap compared with the other groups when given tests that asked them to pair words for their meaning, name words beginning with the same letter, and read a shopping list and recall items on the list. However, the heavy MDMA abusers did show deficits on two tests of mental processing: the Stroop Interference and the R-SAT. 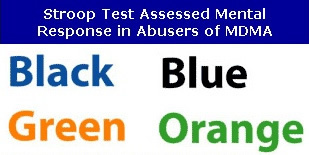 The Stroop Interference test measures the subject's ability to efficiently isolate and process salient information in confusing contexts. In this test, the names of colors are printed in the "wrong" color ink—for example, the word "black" in blue ink. The administrator asks the subject to list, as fast as possible, the colors of the inks. The discrepancy between the meaning of the word and the color of the word can cause a momentary confusion that slows response time, and subjects frequently mistakenly read the word instead of naming the ink color. In the study, heavy MDMA users took longer to read the lists and made more errors than the moderate users. The R-SAT test, which has been used to assess frontal lobe damage in severely impaired people, has never been used before to test substance abuse effects. The test measures a subject's ability to find the most efficient strategy to solve simple problems in a limited time. 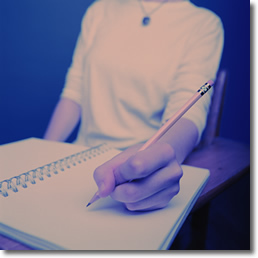 Subjects are given papers with tasks to do, such as adding up numbers. The rules explain that some items have higher value than others and that pages that have a "frown face" should be skipped. Heavy MDMA users completed on average two fewer items in the R-SAT test than did moderate users (between 22 and 50 lifetime uses), who performed on par with nonabusers. This is a large difference in terms of the test, but the researchers cannot qualify it as mild, moderate, or severe because of the small size of the sample. The R-SAT differentials between heavy MDMA abusers and moderate and nonabusers need to be validated by further studies before they can be regarded as established, says Dr. Halpern. At the same time as it raises interesting questions about possible cognitive deficits in MDMA users, this study also illustrates the complexity of evaluating MDMA's effects in humans, notes Dr. Timothy Condon, Deputy Director of NIDA. "The major strength of this study is its inclusion of a unique group of MDMA users who, unlike MDMA users in other studies to date, have had minimal or no exposure to other drugs. The researchers took great care to control for other possible variables to explain their results," says Dr. Steven Grant of NIDA's Division of Clinical Neuroscience, Development and Behavioral Therapies. Still, he adds, there are a number of uncontrollable factors: the volunteer sample may not be representative of MDMA users; the purity or actual MDMA content of drugs said to be Ecstasy is uncertain; differences in performance on any of the tests may be the result of still-unrecognized confounding factors; and the tasks that showed positive association with MDMA exposure have not been used in other studies and therefore need to be replicated. Halpern, J.H., et al. Residual neuropsychological effects of illicit 3,4- methylenedioxymethamphetamine (MDMA) in individuals with minimal exposure to other drugs. Drug and Alcohol Dependence 75(2):135-147, 2004.